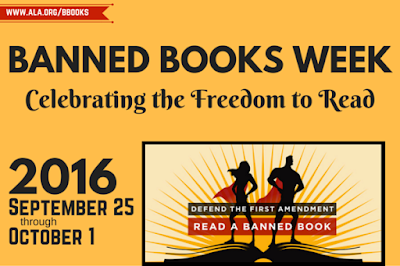 Today is the first day of Banned Books Week. Every year, I do a series of posts in honor of the week and the books that are so important to be kept in circulation, and read by generations to come. As it's the first day, I'm going to talk a bit about what Banned Books Weeks actually is, for those who still may be unfamiliar, and why it's such an important week. I'll also share the list of the top ten frequently challenged books of 2015, and some thoughts on a couple of books on the list. Banned Books Week is an annual event celebrating the freedom to read. Typically held during the last week of September, it highlights the value of free and open access to information. Banned Books Week brings together the entire book community; librarians, booksellers, publishers, journalists, teachers, and readers of all types, in shared support of the freedom to seek and to express ideas, even those some consider unorthodox or unpopular. The reasoning behind Banned Books Week, and why it's important, is that it highlights the importance of free and open access to information. The week also brings together the entire book community, online and offline...libraries, booksellers, publishers, journalists, bloggers, teachers and readers who recognize the need to speak out and support the freedom to produce and have access to all materials, even those that are considered unconventional or unpopular. The focus on efforts to remove or restrict access to books helps to draw attention to censorship and the harm it can cause. It's important to remember that books continue to be banned and targeted for removal and restrictions in libraries and in schools. However, many of the books challenged have remained available due to the extraordinary efforts of librarians, teachers, students and community members who, by standing up and speaking out, refuse to let the freedom to read be abused. Fifty Shades of Grey - I have personally refused to read this book because 1) I have heard it's poorly written and 2) I have a problem with any woman allowing herself to be subjected to abuse because she's in love with a man, AND believing that she will be able to change him. Now, granted I did not read the book and I know there were many who really liked it, or at least didn't absolutely hate it. However, after reading many reviews on Goodreads, I know that this is a book I would not want to waste my time reading. My sister made me watch the movie. I wish I could get those two hours back. All of the above being said, and I get the reasoning behind the challenges to this book (who wants their daughters thinking this is a normal relationship and wanting something like it? ), I do think that this is the moment when parenting comes into play. If your daughter wants to read it, perhaps read it with her to demonstrate and point out the reasons why the relationship in the book is a harmful, inappropriate relationship. This is why being aware of what your kids are reading and watching is important, so we don't miss those teachable moments. I realize there are parents who are not involved and aware. Perhaps those are the kids these challenges are trying to protect, but by protecting the few, harm is being done to the many by restricting access to certain books. Great post! I don't know how I'm going to celebrate Banned Books Week. I may just pick up a banned book I haven't read yet. The Curious Incident of the Dog in the Night-Time? Goodness, how obtuse can you get? This book certainly doesn't need to be on this list! It was a very important book, not only because it was so well written, but also because before then, no one really knew anything about Aspergers. This is a "must read" if I ever saw one! I haven't ever participated in Banned Books Week, I think because it comes during the time of year when I realize I'm behind on all my challenges and decide to read what I already committed to. However, I was planning on reading Night by Elie Wenzel for the Back to the Classics challenge, and so might just do that one this week. I'm with you on Shades of Gray--I will never read that book unless actually paid to do so, and then maybe not! Now for the issue--I don't believe in censorship, but I do think there are some books that are not appropriate for all ages. My daughter and I were just talking about the time when she was 10 and started having anxiety attacks and nightmares--aka "the summer neither one of us slept." Books can create powerful images in the mind, and unsettling books can really jar the psyche. I don't believe in censorship, but powerful books should be handled with care.